When I sat down in the speaker’s lounge this morning to finish up the slides for my presentation, Steve Wozniak was there, sitting at the same table as I, doing the same thing–finishing his notes for a talk he was about to give. Sitting next to him was an Apple employee I know from elsewhere, so I asked her if he’d have time for a quick picture when he finished his notes. After getting the OK, I introduced myself, and (corny, I know) thanked him for inventing a machine that basically changed the course of computing–as well as having a tremendous positive impact on my life. In person, Steve struck me as friendly and outgoing, and he chatted with the folks at the table for a bit before heading off for his talk. So, thank you Steve Wozniak, for the chance to say hello and for taking the time to snap a quick picture with me. I know you must get sick of the requests, but you were gracious and friendly about the whole thing. What a thrill that must have been! I have similar memories of bringing home an Apple //e from a little Apple Computer dealer in Wichita, Kansas around 1983. 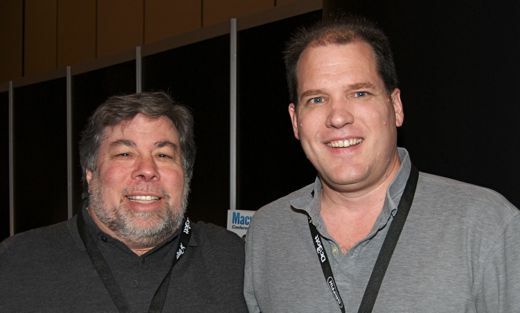 That computer changed my life forever so I am forever indebted to Woz. That is pretty cool, bet you were over the moon !